These products are useful for a range of types of food such as fruit, vegetables and cheese. Before purchasing peeling equipment, consider whether you can avoid having to peel vegetables at all. For example by cooking potatoes in their skins, or roasting/baking vegetables in their skins. 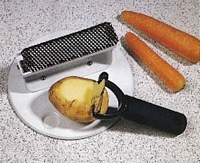 Alternatively, several of the products listed here allow you to scrape vegetables instead of peel. 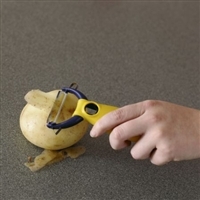 If not, a handheld peeler may help, or if you have reduced grip, tremor or the use of one hand only a table top or powered peeler may be appropriate (Disabled Living Foundation, 1996). Mashing potatoes using a masher with a more comfortable handle can reduce the strength and effort required. As an alternative you could use instant mash or a handheld blender (readily available on the high street). 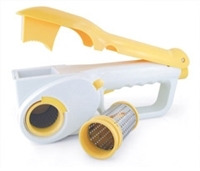 Grating can be made easier by using a grater with a feature such as having food container attached or one integral to a food work station. A box grater is the most stable of conventional graters but only allows you to grate in a vertical action (Disabled Living Foundation, 1996). 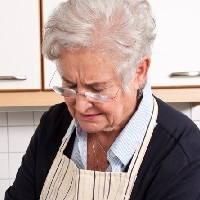 Food processors are able to carry out a range of tasks including creaming and grating.